5 Arrested In Kenyan Attack As Al-Shabab Promises 'Bloodbath' : The Two-Way Some of those arrested in connection with Thursday's deadly attack on a university in the country's east were reportedly trying to flee to neighboring Somalia, where the extremist group is based. 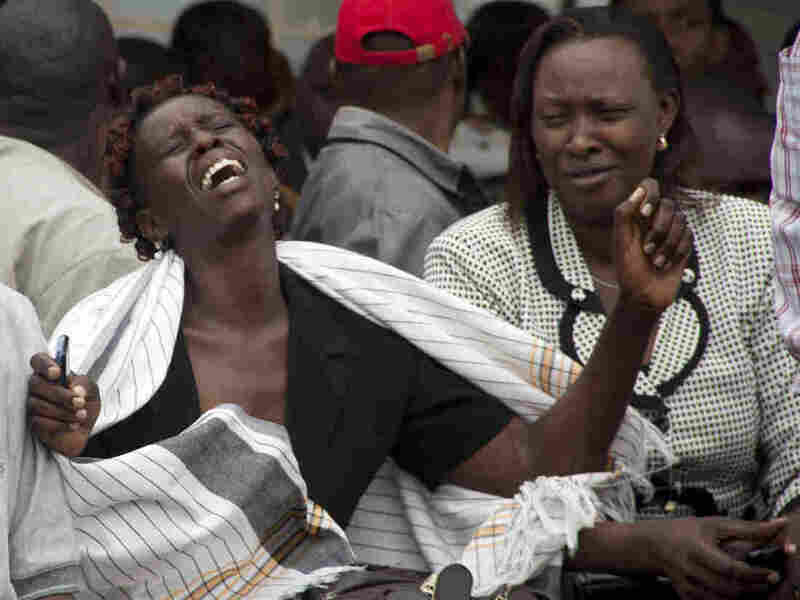 A woman cries after she viewed the body of a relative killed in Thursday's attack on a university, at Chiromo funeral home, in Nairobi. Kenyan officials say that five suspects have been arrested in connection with this week's attack by al-Shabab militants on a university in the country's east, killing 148 people, as the Islamist extremist group warned that more bloodshed is forthcoming. Kenya's internal security minister says some of the suspects were captured while trying to flee to neighboring Somalia, where the al-Shabab movement is based. The attack at Garissa University College on Thursday was the deadliest in the east African nation since 1998, when al-Qaida bombed the U.S. embassy in Nairobi. Al-Shabab, which claimed responsibility for the attack, said it was in retaliation for Kenyan forces participating in an African Union force against the Islamist group, which controls large swaths of territory in Somalia. "Authorities have begun moving the bodies of many of the students killed by the Islamist militants at Garissa University College to the capital for identification. "Families gathered in Nairobi Friday following the attack at the school, which left the 148 people dead as well as the four attackers. "Relatives formed lines outside of a mortuary as they waited for news of the missing." "Kenyan security agencies arrested three people trying to cross into Somalia, said Interior Ministry spokesman Mwenda Njoka in a Twitter post. He said the three are associates of Mohamed Mohamud, also known as Dulyadin Gamadhere, a former teacher at a Kenyan Madrassa Islamic school who authorities say coordinated the Garissa attack. Kenyan authorities have put a $220,000 bounty for information leading to Gamadhere's arrest. "Two other suspects were arrested at Garissa college." Meanwhile, al-Shabab has vowed more attacks are forthcoming. "Kenyan cities will run red with blood," said al-Shabab in a statement on Twitter, reported by the SITE intelligence monitoring group. "This will be a long, gruesome war of which you, the Kenyan public, are its first casualties," the statement said. "No amount of precaution or safety measures will be able to guarantee your safety, thwart another attack or prevent another bloodbath," the group said. Kenyan President Uhuru Kenyatta, speaking in a nationally televised address, vowed that his administration would "respond in the severest ways possible" to the Garissa attack. "We will fight terrorism to the end," said Kenyatta. "I guarantee that my administration shall respond in the fiercest way possible."